Whatever we do, wish, hope, dream, chase, or fear, the time will always go on with or without us. Whether it is a new job or a move to somewhere more green or has better schools for the kid, there will be a time when the activity begins and ends. From the first sundial, people have wanted to record time. Now we have silent, digital time. Their ancestors were the drip-drop of the clepsydra. The clepsydra, a simple vase marked with divisions that measured water flowing out of small spout near the base was used in Egypt before 1500 B.C.E. Another ancient water timing device is from India and is called Ghatika yantra. It consists of a small, hemispherical bowl (made of copper or coconut) with s a small hole in its base. Floated in a larger pot of water, the bowl would gradually fill and sink. When it reached the bottom an audible thud alerted the timekeeper, who then would raise it up to start the process again. This became very popular in Buddhist and Hindu temples and later was widely used in Indian Muslim mosques. What I am thrilled and always have goosebumps, as our story begins with 13th-century water clocks and an ingenious man called Al-jazari (Read more) from Diyar Bakir in southeast what is now Turkey. 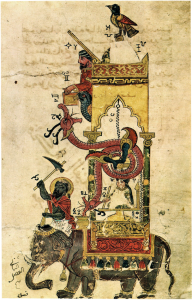 He was a pious Muslim and a highly skilled engineer who gave birth to the concept of automatic mechanics. He was inspired by the history of mechanics and technology of his predecessors, in particular, ancient Greek and Indian scientific inventions. The outcome of this royal urging was an outstanding book on engineering called” The of Knowledge of Ingenious Mechanical Devices"(Read more). This book became an invaluable resource for people of different engineering backgrounds, as it described 50 mechanical devices in six categories, including water clocks. Just as we need to know the time today, so did Muslims more than 700 years ago, and Aljizari kept to Muslim traditions, as they knew that the time could not be stopped and that we’re always losing it, and that it was important to know the time to use it well, when doing good deeds. Most importantly, Muslims needed to know when to pray at the right times each day and mosques had to know the correct time so they could announce the call to prayer. Also, important annual events such as when fasting in Ramadan, celebrating Eid or going on pilgrimage to Mecca, all of these had to be anticipated. 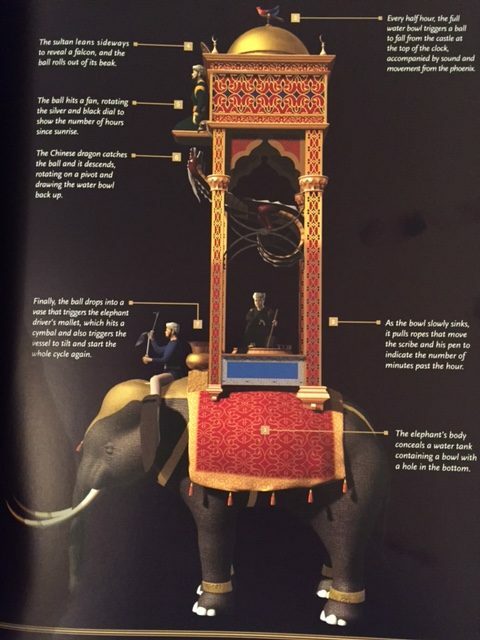 This inspiration meant that the “Peerless devices” to which King Nasir al-Din referred including the Elephant Clock, as well as telling the time, this grand clock was a symbol of status. grandeur and wealth, it also incorporated the first robotics whit moving, time-telling figures.